Gold has always been a key to power: it doesn’t corrode, so it holds its value, and, as every ruler knows, access to gold is essential for paying armies and controlling the state. Furthermore, in skilled hands, this precious metal can be transformed into beautiful and desirable objects which, in turn, help to cement alliances, reward allies and demonstrate the power of the ruler. It is not surprising, therefore, that the Goldsmiths’ Company received its first royal charter in 1327. Right from the beginning, the Goldsmiths’ Company made sure that the high standards of both the gold and the workmanship remained constant, and in 1478 they set up an Assay Office to test the gold and ensure that every object which was up to standard was hallmarked with their leopard’s head symbol, as still happens today. Inevitably, at times, they found themselves opposing the monarch – a dangerous position, particularly when the monarch in question was Henry VIII. He always needed money and demanded that they lower the gold standard. The Goldsmiths’ Company refused. Fortunately for them, Henry died before he could enforce his will. The first Goldsmiths’ Company Hall was built in 1407 in Foster Lane, off Cheapside in the City of London, on exactly the same footprint as the current Goldsmiths’ Hall (1835) which is the third building to occupy the site. Philip Hardwick, the architect chosen to rebuild Goldsmiths’ Hall, came from an architectural family and trained under his father. He went on to become the architect of choice if you wanted someone who could be trusted to deliver the goods on time and within budget. Furthermore, he understood the importance of making an impression. 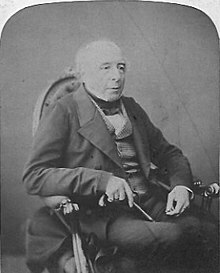 He designed an astonishing number of railway buildings (including the Euston Arch), imposing warehouses and other commercial buildings which echoed Victorian Imperial wealth and self-confidence and Goldsmiths’ Hall was his masterpiece. 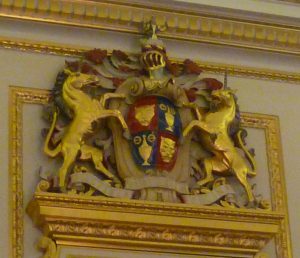 One has only to look at the façade of Goldsmiths’ Hall, which runs along the entire block of Foster Lane, to see that this building, belonging to one of the grandest of the livery companies, proclaims its importance. It sits right against the pavement and its six huge columns with their Corinthian capitals support a richly carved entablature showing the Company’s coat of arms and various emblems of war and, somewhat incongruously, music. The general impression is of Imperial Rome. Inside, a massive staircase rises from a vast entrance hall which goes up to the full height of the building; it starts as one stair and then breaks into two which turn off at right angles. It’s a magnificent entrance, designed to impress. The carpet is scarlet, edged with a gold pattern and held in place with stair rods. Looking down from the top of the stairs, you can see that the people standing at the bottom are dwarfed. 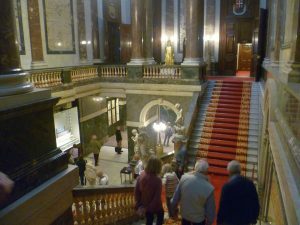 At the top of the stairs is the magnificent Livery Hall lined with columns of scagliola (Italian plaster work painted to look like marble) with Corinthian capitals, and the richly-moulded and colourful ceiling is equally impressive. I longed to lie on the floor to admire it better. 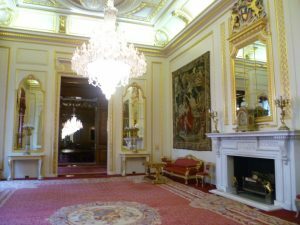 The room isn’t easy to photograph; visitors are not allowed to photograph gold plate for security reasons, and the glare of the chandelier lights tends to blot out the detail around them. The chandeliers are interesting. Their bases have been cleverly converted to electricity for everyday use, but the forty-eight glass flutes above hold real candles which show off the crystal facets shimmering in the candlelight on those special occasions when the room is candlelit. Once a year, the chandeliers are lowered so that they can be dismantled, washed, dried and reassembled. From the Livery Room, a short corridor takes you past a gilded wooden statue of St Dunstan, the patron saint of goldsmiths, jewellers and locksmiths, which was originally made for the Goldsmiths’ Company’s state barge. St Dunstan holds his archbishop’s crozier (he was Archbishop of Canterbury) in his left hand, whilst his right hand holds a pair of long tongs – he was also a metalworker. The story goes that one night he was tempted by a vision of a beautiful woman, whereupon, he seized the hot tongs and gripped the vision’s nose; with a yell and a whiff of brimstone, she promptly turned into a demon – and vanished. Looking at St Dunstan, one cannot fail to notice his embonpoint, so sins of the flesh were obviously not unknown to him; rather reassuring for a patron saint. 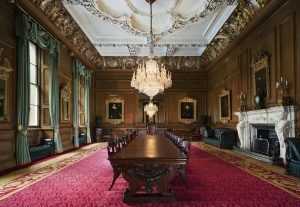 The Court Room is where the Prime Warden, his advisers and the Court of Assistance decide who to take on as an apprentice and, when they have completed their apprenticeship, which of them should be admitted to the Freedom of the Company which allow them to practice their trade independently. 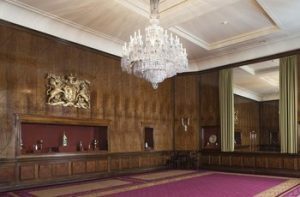 The Court Room contains a fair amount of recycled material from the second 17th century Goldsmiths’ Hall’s Court Room, including the oak panelling and plaster ceiling, and a rococo-style marble chimney piece thought to be by the French sculptor, Roubiliac. 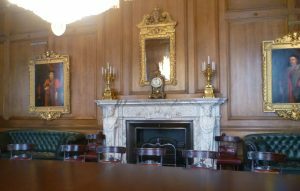 I liked this room; it has a grace and elegance which is missing from the grandeur of the Livery Room. A small ante-room leads to the Drawing Room. 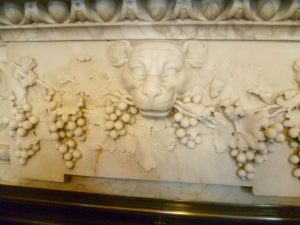 This part of Goldsmiths’ Hall was badly damaged during the Blitz. An 1895 photograph of the original Drawing Room shows an ornate rococo room with a heavily-plastered ceiling, absolutely stuffed with 18th century damask-covered and gilded chairs – more than enough to play Musical Chairs. Some of these, together with some sofa-tables, settees and window-seats, survived and have been re-upholstered. But there are now far fewer of them, thank goodness. 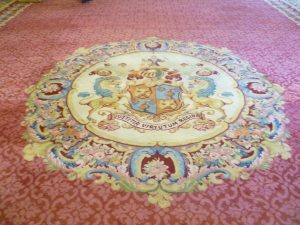 I particularly like the rose-coloured carpet with the Company’s coat of arms in the centre – an exact replica of Philip Hardwick’s original. The general effect of the restoration, re-designed by the French architect, Fernand Billerey (1878-1951), and completed in time for the 1951 Festival of Britain, has a light 18th century feel about it. One can picture Marie-Antoinette and her ladies taking tea here. Immediately behind the Drawing Room is the Exhibition Room. This, too, suffered in the war and was rebuilt in the 1950s and panelled in English walnut in a lozenge pattern. It is here that the Goldsmiths’ Company shows off the best pieces in their gold and silver collection in specially-designed show cases. 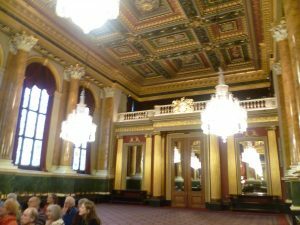 I left the Goldsmiths’ Hall slightly stunned by so much magnificence. Yes, it is impressive, and the gold and silver objects displayed are obviously top quality but, somehow, a touch of intimidation has crept in; I can imagine suppliants being very careful not to offend the Prime Warden. 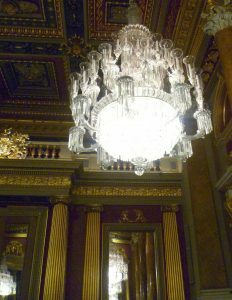 However, Philip Hardwick undoubtedly fulfilled his brief and his Goldsmiths’ Hall, all gold and marble, shimmering chandeliers and magnificent gold plate, stands out as one of the most sumptuous building in the City of London. It’s well worth a visit. Never knew anything about this place. Amazingly sumptuous as you say. Looks gorgeous, to be honest. The kind of place to stimulate a historical novelist’s imagination. I agree, Elizabeth. Only the best for the Goldsmiths! But, I have to admit that, apart from the Medieval period, when widows of goldsmiths were allowed to be members, for most of its history, it has been exclusively male. Still, I suppose the same could be said for all the City Livery Companies until well on into the 20th century. Thanks so much for introducing us to this amazing place, Elizabeth. As you say, it is quite sumptuous; I must get there soon. But I do agree that the scale and opulence make it somehow a bit forbidding – redolent not only of wealth and taste, but also of power. Thank you for your comment, Eleanor. I know what you mean about the power but, remember, they stood up to Henry VIII in the 16th century. And it might reassure you to know that they were on Parliament’s side during the Civil War.